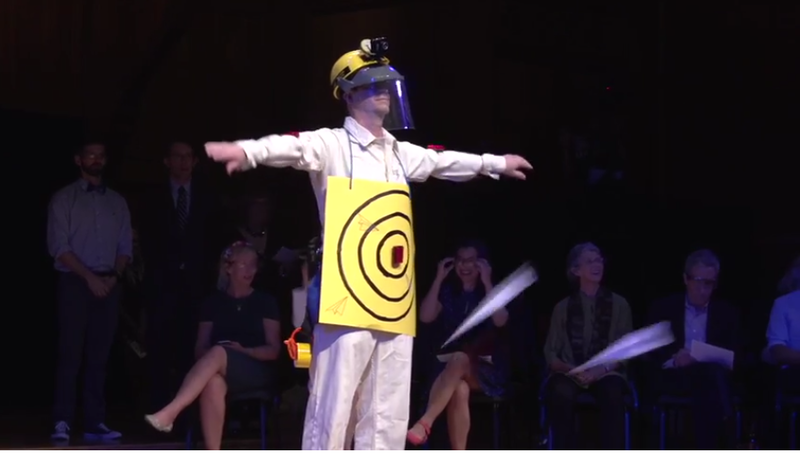 For 27 years, Marc Abrahams has been awarding Ig Nobel prizes, honoring scientific achievements “that first make people laugh, and then make them think.” Last week’s installment of the annual event was broadcast to every major social media platform — YouTube, Facebook Live, Twitter, Instagram, and Snapchat — and Abrahams told the audience that a specially-edited audio version will be broadcast on public radio’s “Science Friday” the day after Thanksgiving. 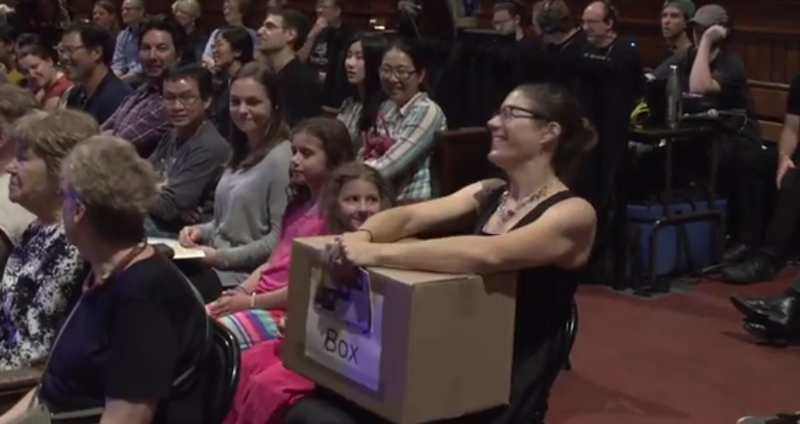 If the secret to success lies in thinking outside the box, then Abrahams may be cultivating the next generation of geniuses, leading an audience at Harvard’s Sanders Theatre beyond the obvious practical applications of science — and into something much stranger. Maybe it’s all proof of how much you can accomplish if you keep a playful attitude. Abrahams is also the editor and co-founder of the Annals of Improbable Research, a science humor magazine published six times a year, so he already knew how to make serious subjects fun heading into last week’s awards show. 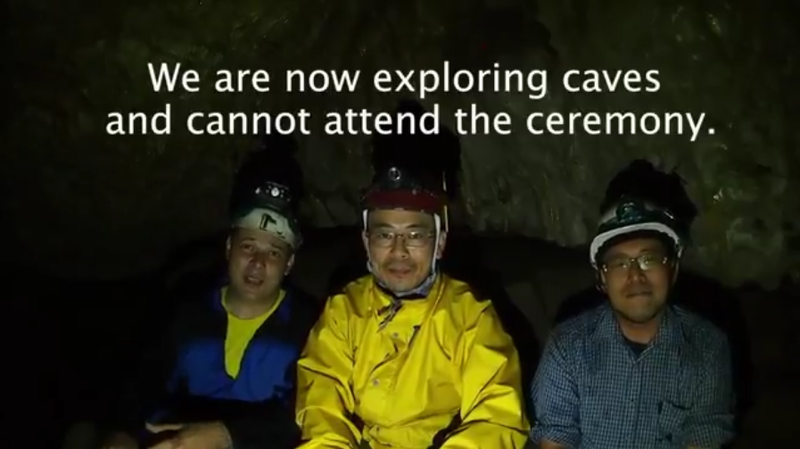 The silly ceremony began with paper airplanes, all aimed at a “human aerodrome” — a man wearing safety goggles, a helmet, and a target — after which the chaos began with appropriate scientific pomp. But the airplane launch was introduced by Nicole Sharp, the real-world creator of the fluid dynamics blog FYFD, and scattered throughout the event were several figures from the world of serious science — including several winners of the actual Nobel Prize. 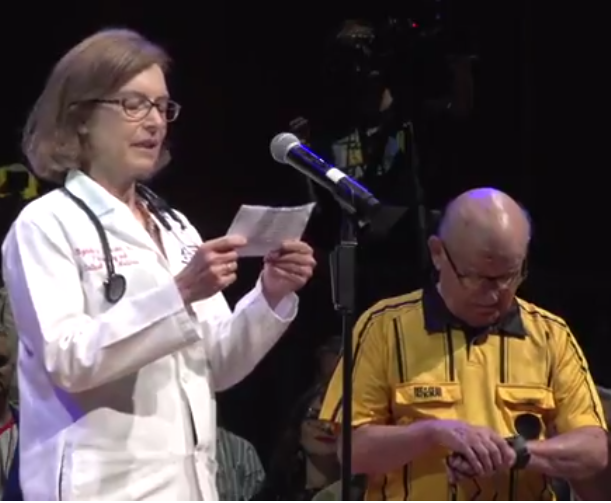 Even the event’s traditional “welcome welcome” speech came from real-world professor Jean Berko Gleason, an 85-year-old expert in brain science who apparently flew in from Cleveland to deliver the two-word speech. 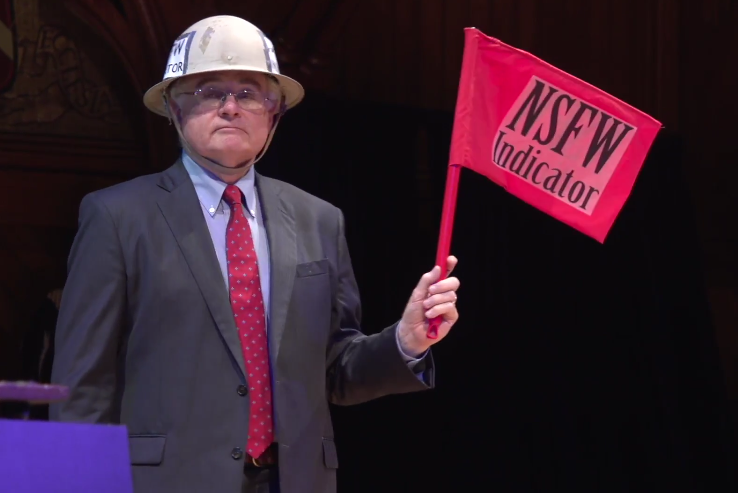 This year, in keeping with the irreverent spirit of the Ig Nobel prizes, the emcee was Karen Hopkin, creator of the Stud Muffins of Science calendar, who told the hall that this year’s Ig Nobel winners came from five different continents. And then, with a deadpan serious reminiscent of Groucho Marx, Abrahams himself arrived, tossing a paper airplane of his own, thanking the event’s sponsors, and announcing the theme for this year’s ceremony: uncertainty. The awards were given to the authors of real papers published in academic journals around the world — including the prestigious British Medical Journal and Frontiers in Human Neuroscience. 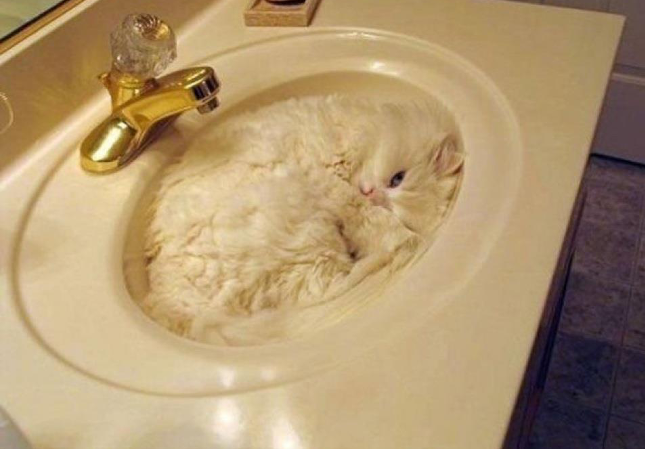 For example, Marc-Antoine Fardin applied rheology — the branch of science which studies the flow of matter — to the question of whether or not cats are liquid. He was Following up on a “meta-study” published in the decidedly non-scholarly site BoredPanda which had pointed out that cats do, after all, take the shape of containers. 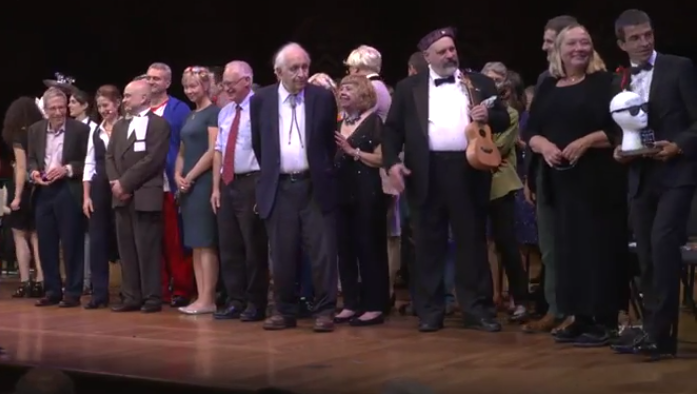 Like many of the winners of this year’s Ig Nobel prizes, Fardin appeared in person to collect his award. But of course, there was a twist. Acceptance speeches were to be kept to their allotted time by an eight-year-old girl described as “the charming, the delightful, the ever-so-cute Ms. Sweetie Poo,” who was instructed to repeatedly chant “Please stop, I’m bored” if anyone spoke too long. To illuminate the proceedings, the event also featured the “human spotlights” — two silver-skinned people who were both holding flashlights. And there was even a “social media butterfly catcher” onstage, to deliver live updates to the various social media platforms. 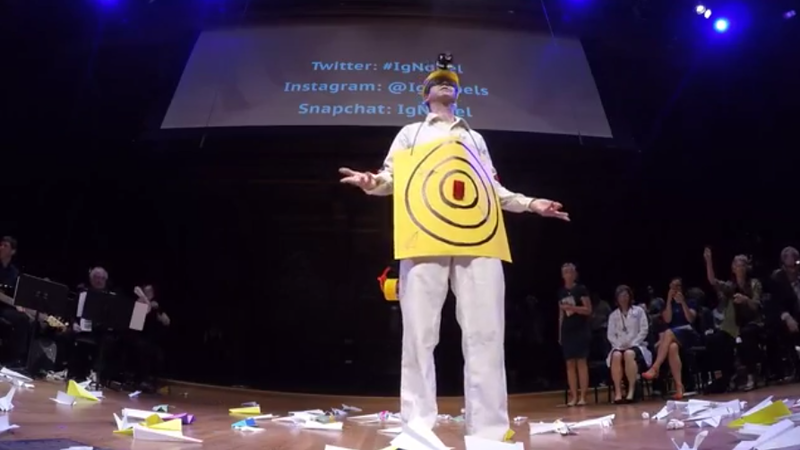 The official tweeting dodo of the Ig Nobel awards is ready. 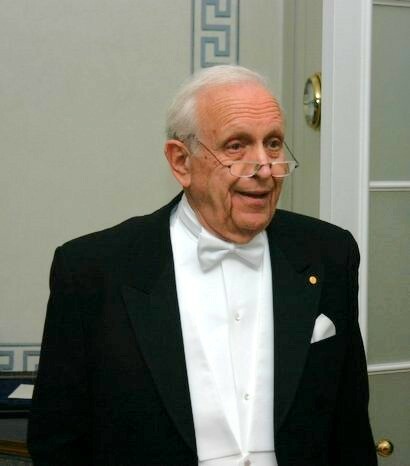 “All right, let’s get it over with,” Abrahams joked, as emcee Hopkin approached with a brown-paper grocery bag full of awards to hand out — “a replica of a human head supporting a replica of a question mark” Winners also received certificates — signed by actual Nobel prize winners — plus, a cash prize of ten trillion dollars. Really. The catch was they were bank notes for ten trillion Zimbabwean dollars — a demonetized currency which is no longer honored. Although the bills were handed out by actual winners of the Nobel prize. The ceremony started with the winner of this year’s physics prize — as well the first appearance from Ms. Sweetie Poo as he closed his speech. That must of been quite a journey for the Australian researchers who described their experiment on how didgeridoo playing effectively treats sleep apnea. They took the podium wearing pajamas, and one actually played the Australian instrument to the microphone. Here’s how their speech concluded. One of the researchers who used advanced brain-scanning technology to measure the neural basis for disgust with cheese. 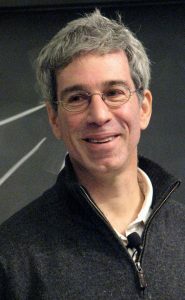 The proceedings were also interrupted twice for “a moment of science” — for example, when Nobel laureate Eric Maskin introduced two presenters who created a standing wave using a spring (drawing a round of genuine applause from the audience). But the chaos never stopped. The event also included what was described as the world premiere of a new three-act mini-opera called “The Incompetence Opera,” apparently based on the Peter Principle. (First line: “A psychologist walks into a bar…” — where he inevitably ends up commiserating with an equally incompetent bartender.) 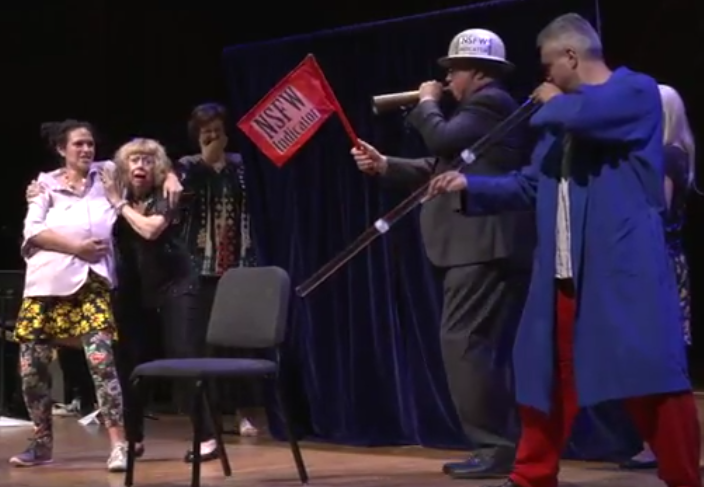 By the time they’d reached Act 3, emcee Karen Hopkin was actually carrying a drink — though its finale about the Dunning-Kruger effect was actually very poignant. There was also a special segment called the 24/7 lecture, again featuring several prominent real-world researchers and academics. First, they’d spend 24 seconds offering a complex technical description of their work, “And then, after a brief pause, a clear summary that anyone can understand in seven words.” Of course, there was a referee — an actual professional referee named John Barrett — who blew a whistle at the 24-second mark. Abrahams then introduced their new “win an empty box” contest, in which Nobel laureate Eric Maskin first examined the box to confirm that it was, in fact, empty. The winner was the attendee whose program included on page six a picture of a crocodile swimming in a cup of coffee. This was followed by the second paper airplane deluge — exactly 30 seconds in duration. And then Nobel laureate Oliver Hart introduced another moment of science — an experiment which misfired, turning into a long segment in which two men in white lab coats tinkered unsuccessfully with their equipment. One of the most dramatic moments came when three nervous stagehands carried on a box labeled “Warning! CROCODILE” — removed its yellow tape, and then were warned off from proceeding by the event’s “Not Safe For Work” indicator — noted NY attorney William J. Malone, who had agreed to sound a horn if anything seemed inappropriate. The event concluded with another tradition — the goodbye-goodbye speech — conducted again by brain science expert Jean Berko Gleason. GPS-powered research determines there’s a logic to how squirrels bury their nuts. How a 28-year-old entrepreneur is bringing back Polaroid’s “instant photography”. Big backlash greets an automated Bodega startup. What modern developers could learn from mainframe programmers. Colorblind senior surprised with eyeglasses that let him see colors.